If a crack or chip in your windshield is blocking your line of sight, it’s highly recommended that you have your windshield replaced as soon as possible. Anything that takes your attention off of the road in front of you is a serious hazard, and should be addressed. In many municipalities, police have gotten stricter on windshields like these, making it illegal for you to drive your vehicle on the road until it is repaired. This is because you’re not only compromising your safety, but the safety of others on the road. The truth of the matter is that not all windshield cracks are equally dangerous. Whereas some are cause for immediate attention, others can linger for a while without having to be repaired. Be warned, however, that a small crack can turn into a large crack over time. This means that, in essence, if you have a crack in your windshield, it’s a potential safety hazard. While you may not need to have it repaired, we strongly recommend that you do. While chips are not as worrisome as cracks, they still require close attention. In the vast majority of cases, a chipped windshield is not a potential safety hazard. However, like cracks, chips can grow larger and turn into hazards. Most chips can be repaired fairly quickly and fairly affordably. Should your windshield incur a chip, we recommend that you have it patched up as soon as possible. In some cases, a windshield will incur a scratch without incurring either a chip or a crack. In general, this is not a reason for an immediate windshield replacement. However, if you value the aesthetic of your vehicle, you would be wise to have your windshield replaced. After all, a huge scratch on your windshield will drastically reduce the overall appeal of your car. When you take a close look at your windshield, do you notice that it’s starting to get white around its edges? If so, this is a sign that the protective plastic layering that covers it is likely starting to disconnect. This layering is a safety device that is used to prevent glass from fully shattering. If this layering is peeling off, that means there are parts of your windshield that are prone to full shattering. Should you get into a serious auto accident, flying pieces of glass could put you and the others in your vehicle in even greater danger. If you notice white around the edges of your windshield, it’s wise to have it replaced as soon as possible. Looking for Professional Windshield Replacement in Villa Park? Is your windshield demonstrating any of the signs reviewed above? 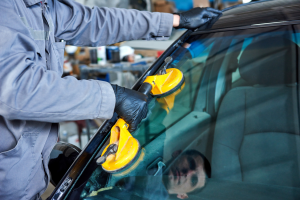 Are you looking for professional windshield replacement in Villa Park, Illinois? If so, Lombard Body & Fender has you covered. Family-owned and operated for over 45 years, we have replaced a wide variety of windshields on vehicles throughout the Villa Park area. Regardless of the make and model of your car, we can replace yours as well. Contact us now to start the replacement process! You got me when you said that you must have your windshield replaced if the cracks on it are blocking your line of sight. I will share this with my husband. His car’s windshield has cracks that are getting larger. Our son accidentally hit it with a stone while playing in the yard. To ensure the safety of my husband, I will have him read your blog.